The plug-in hybrid drive of the MINI Cooper S E Countryman ALL4 combines the best of two worlds. The familiar space under the bonnet is occupied by a 3-cylinder petrol engine with MINI TwinPower Turbo Technology from the latest generation of the BMW Group engines. From a capacity of 1.5 litres this mobilises a peak output of 100 kW/136 hp. The maximum torque of the engine is 220 Newton metres, which goes on stream at 1 250 rpm. In the MINI Cooper S E Countryman ALL4, the combustion engine is combined with a modified 6-speed Steptronic transmission. This transfers its power to the front wheels based on the characteristic MINI principle. The second power unit of the MINI S E Countryman ALL4 is an electric motor that is housed under the luggage compartment floor. Designed according to the principle of a hybrid synchronous motor, the electric drive offers an output of 65 kW/88 hp – which is particularly high considering its size and weight – and generates a maximum torque of 165 Newton metres that is characteristically available directly from standing. In addition, it provides constant power delivery even in high engine speed ranges as well as a very high level of efficiency. The electric motor directs its power to the rear axle via a two-stage single-speed transmission. The lithium-ion battery is positioned directly in front of the electric motor underneath the rear seat. It is made up of five modules, each comprising 16 battery cells, and like the electric motor it is produced at the Dingolfing plant, the BMW Group’s competence centre for eDrive technology. The high-voltage battery has a capacity of 7.6 kWh. At a wallbox with a charging capacity of 3.6 kW it can be fully charged in 2:15 hours. Charging at a regular household socket takes 3:15 hours. The intelligent energy management system controlled by the power electronics of the plug-in hybrid system ensures that the interplay between the combustion engine and the electric motor is optimised for both driving fun and efficiency in all situations. Using the power of the electric motor alone, the MINI Cooper S E Countryman ALL4 is able to provide locally emissions-free driving fun with hallmark brand spirit in many situations in day-to-day traffic. In the event of more intense acceleration, the electric motor supports the combustion engine via a boost function. A total system output of 165 kW/224 hp and a combined torque of 385 Newton metres are available for athletic sprints. The MINI Cooper S E Countryman ALL4 accelerates from zero to 100 km/h in 6.9 seconds. AUTO eDRIVE Purely electric driving up to 80 km/h, the combustion engine is additionally enabled at higher speeds, in particular when accelerating quickly or when the battery charge falls below seven per cent. MAX eDRIVE Purely electric driving up to 125 km/h, the combustion engine is additionally enabled at higher speeds or on kickdown. SAVE BATTERY The car is powered by the combustion engine, the battery charge state is kept above 90 per cent or raised to this level by the starter generator. In the standard setting AUTO eDRIVE, the MINI Cooper S E Countryman ALL4 runs on electrical power only up to a speed of 80 km/h. At higher speeds and in the case of very intensive loads, the combustion engine is automatically enabled in addition. In MAX eDRIVE mode the vehicle is powered by the electric motor alone at speeds up to 125 km/h. What is more, the SAVE BATTERY mode can be selected so as to relieve the capacity of the high-voltage battery or raise its charge state to at least 90 per cent so that sufficient electrical power remains for locally emissions-free driving later on. Versatile and variable in the interior, too. The special features of the cockpit include a yellow start/stop unit at the centre of the toggle switch panel and a performance display in the instrument cluster on the steering column. 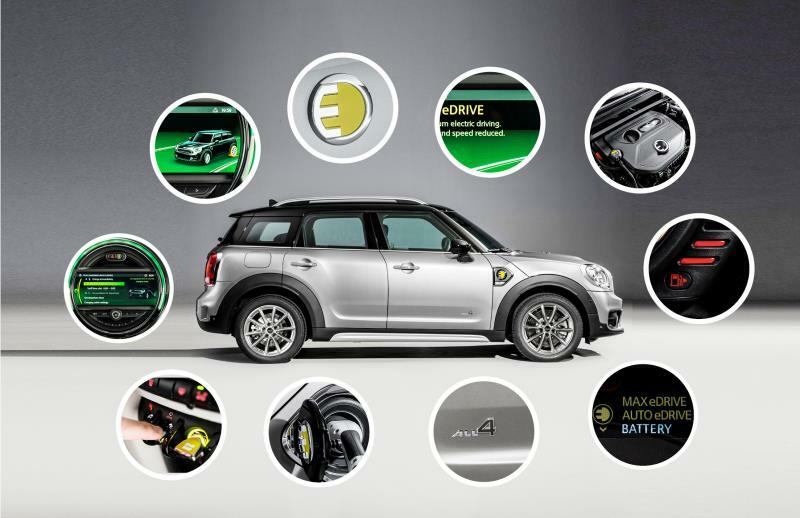 The MINI Cooper S E Countryman ALL4 comes as standard with the Radio MINI Visual Boost featuring a 6.5-inch colour screen in the central instrument. In addition to the MINI Country Timer, this also displays information such as the charge state of the high-voltage battery and operating mode of the hybrid drive selected by eDrive toggle switch. In conjunction with the optional Wired package including MINI navigation system Professional, operation is via an 8.8-inch screen with a new graphic design and touchscreen function as well as via the Touch Controller in the centre console.